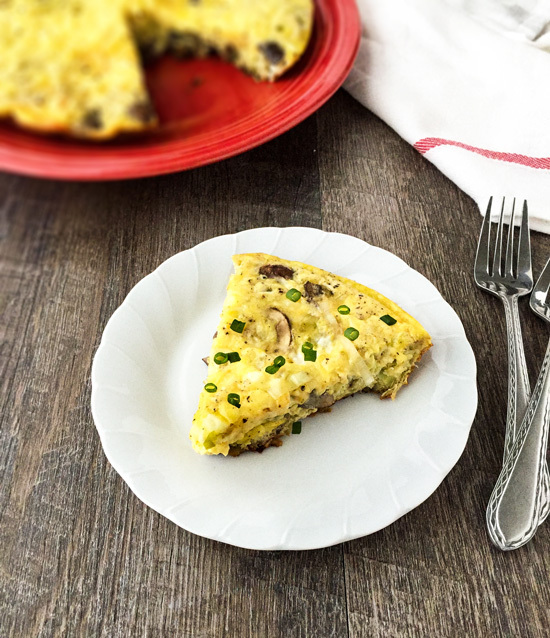 This Mushroom Leek and Cheddar Frittata is a tasty and nutritious meal that is perfect for breakfast, lunch or even dinner! I’ve told y’all that I am not a fan of mushrooms, but I do try to eat them occasionally because they’re good for you. 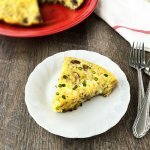 The one way I don’t mind them so much is in a frittata like this one. My husband loves them, so that’s another reason why I try to come up with ways to eat them. He will eat them completely raw, and I’m just like, no way! If I order a dish at a restaurant that contains them, I will pick them out and give them to him. Ha! Leeks are one thing we both enjoy eating. Their subtle oniony flavor and sweetness is simply delicious. I usually buy the trimmed leeks in a package at Trader Joe’s. I like the convenience of having them already trimmed, but you still need to clean them. You may have already seen how many people clean leeks by slicing, then placing in bowl of water to rinse them off. I hate needlessly dirtying extra dishes, so I prefer this method. It works perfectly and no extra bowl to clean. Frittatas are a great way to get a nutritious, one skillet meal on the table for your family. They can be made ahead, so they’re great for busy mornings. The versatility of them makes them one of my favorite healthy breakfast foods. You can create dozens of variations by just changing out the ingredients. Ingredients like mushrooms and leeks make this a healthy breakfast dish that contains loads of nutrients. Leeks are a good source of vitamin K, manganese, vitamin B6, Copper, Folate and Iron. Crimini mushrooms contain Folate, and are a very good source of Thiamin,Niacin, Riboflavin, Vitamin B6, Pantothenic Acid, Phosphorus, Zinc, Potassium, Copper, Manganese and Selenium. Of course, frittatas don’t have to be just for breakfast. They can also be a super easy dinner time meal for those nights where you just don’t feel much like cooking. Add a tasty salad alongside it, and there you go. Dinner is done! Place one of the oven racks in the upper third of your oven. Preheat it to 350°F. In a 10-inch nonstick skillet, heat the oil over medium heat. Add the sliced leeks, let cook, stirring occasionally, until softened, about 5 minutes. Add the mushrooms to the skillet, let cook, stirring occasionally, until softened and liquid has evaporated, about 8-10 minutes. While the vegetables cook, whisk the eggs, heavy cream (or half and half), salt and pepper in a large bowl. Mix in 1/2 cup of the cheese. Pour the eggs over the mushroom mixture, shaking the pan, if necessary to distribute evenly. Let cook, without stirring, until the edges have started to set, about 5 minutes. Top with the rest of the cheese, place into the oven. Bake until center has just set, about 20-25 minutes.